Famous Motovun in Croatia, known for International Film Festival, was the location of the Insights project partners meeting hosted by LAG Central Istria. The focus of the study was the transnational learning and exchange on green and healthy tourism. 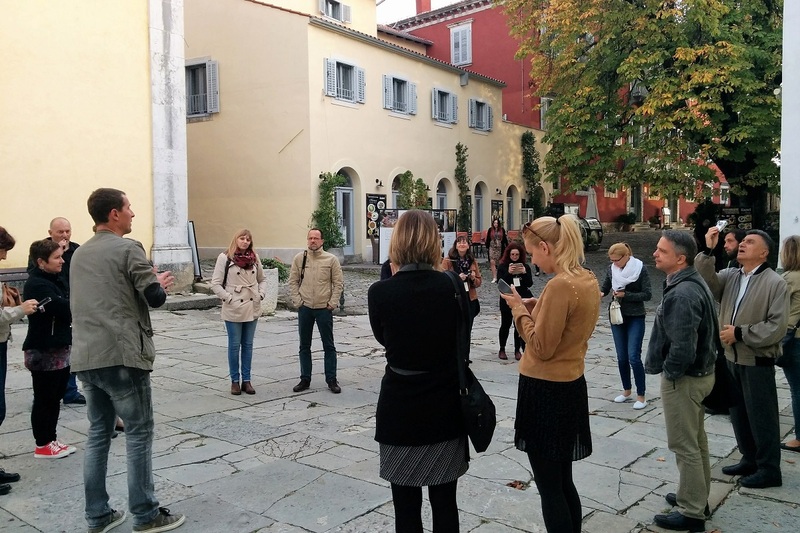 Partners were introduced to the best practices of Central Istria region, starting with the wine tasting at the Tomaz Winery, bike riding at the Parenzana trail, traditional Istrian pastry making at Agrotourism Ograde and the adrenaline-cultural experiences of tourist offers in Pazin. Partners met on Tuesday afternoon at Hotel Kaštel in Motovun for a short presentation of Istria with the specific emphasis on the Central Istria region. Partners were welcomed by the local partners from the LAG Central Istria and the director of Central Istria tourist board Sanja Kantaruti. The historical development of the region was presented by Davor Šišović, reporter from the local daily newspaper »Glas Istre«. Later partners also took a guided walk around the old town of Motovun, situated on a hill 270 metres (886 feet) above sea level. Motovun is a medieval town known among today's population of Istria as the city of Veli Jože, the good gentle giant described in a famous tale written by the Croatian poet and writer Vladimir Nazor. Today it is well known for the international Film Festival of independent and avant-garde films and the Teran wine and Truffle culinary festival. The day ended with wine tasting at the local Tomaz Winery. 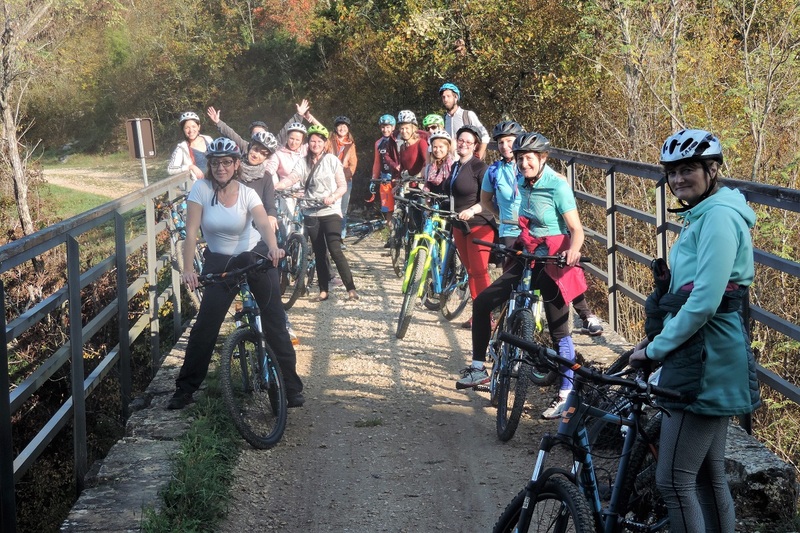 Day two of the study visit started with the unique experience – the Parenzana bike trail ride from Motovun to Agrotourism Tikel in Špinovci, where the partners continued with their Steering Committee and Thematic meeting. Parenzana was a narrow gauge railway which connected Trieste with Poreč, operating from 1902 until 1935. With 3 continuous EU co-funded projects it became one of the best known bike trails in Europe inviting nature loving tourist to experience the Mediterranean cities and local attractions while breathing in fresh air during cycling in the middle of the unspoiled Istrian nature. In the evening the partners were able to test their skills in the traditional Istrian pastry making workshop at Agrotourism Ograde, one of the oldest registered agrotourism family farms in Istria. Agrotourism Ograde spreads over 13.000 m2 and specialises in agriculture, cultivation of domestic animals and agrotourism. The name Ograde was given by pastorals because of the fence of stone that has been all around it. 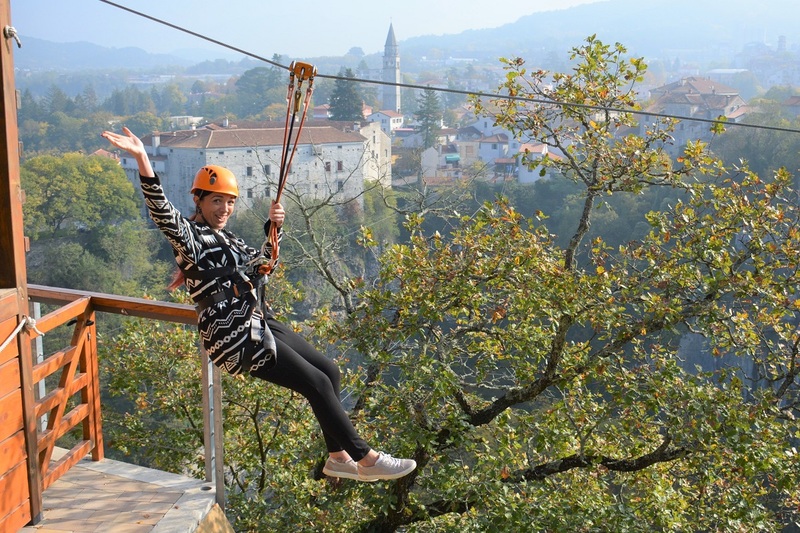 On Thursday partners visited Pazin where they could choose between the ZipLine Pazinska jama adrenaline experience and Pazin Castle visit. ZipLine Pazinska jama consist of four lines and are altogether approximately 660 m long with the highest point of 100 m above the ground. Flying on the zip-line offers enough time to enjoy the unusual view on a grandiose abyss and a medieval castle on its cliffs. On the other hand, the Pazin Castle is a medieval fortification built on a solid rock situated in the middle of the town of Pazin. For many centuries it was the administrative seat of the County of Pazin or County of Istria, governed either by a castle captain castellan, or the count himself. Today it holds two museums - Ethnographic Museum of Istria and Pazin Town Museum. The last stop of the study visit was at the cemetery church of St. Mary of the Rocks, situated in the vicinity of Beram. Within itself it holds one of the most valuable accomplishments of Istrian medieval painting - well preserved late-gothic frescos almost entirely covering the inner walls of the church made by master Vincent of Kastav. The strongest impression leaves the fresco called „Dance of the Dead“, where in front of our eyes kings, merchants, cardinals, even the Pope himself are dancing hand in hand with death. The next multilateral study visit will take place in Hungary in March 2018.